October 17th at the Whale Harbor Restaurant & Marina, Harbor Events, Oasis Ballroom. 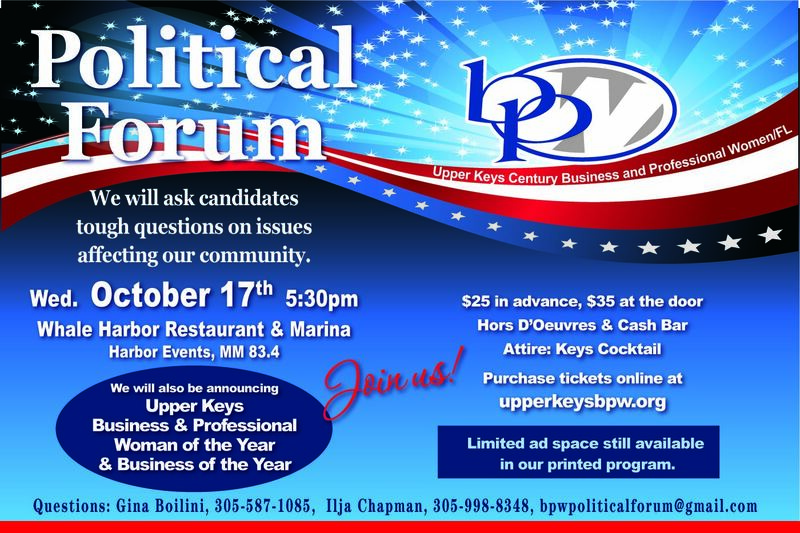 The Upper Keys Century Business and Professional Women (BPW), hosted its first Political Forum in 1985 and have organized this highly anticipated community event in every election cycle since then. Place an ad in our full color 2018 Political Forum Program! CLICK HERE to secure your spot today! We invite you to submit your questions! BPW is known for asking candidates tough questions on issues affecting our community. We are soliciting questions from our members, and invite you to submit questions that you would like to be asked. All will be considered by our committee as they select the most relevant. Please send them to bpwpoliticalforum@gmail.com.